. @JimNashMN on @Rebecca_Otto : “Our current state auditor is one of our favorite cat toys.” He's setting up the GOP's endorsement of @PamforAuditor , who is running for the open position. 3rd District Republican Congressman Erik Paulsen told state GOP convention delegates he’s knows he’s “got a target” on his back. Pete Stauber, the Republican candidate for Congress in Minnesota’s 8th District, welcomed attendees at the state GOP convention to his area of the state Saturday morning. Stauber says his “blue-collar, common sense” message is resonating throughout the 8th District, which spans from just north of the twin cities to the Canadian border. 8th District DFL Congressman Rick Nolan is not seeking re-election. Republicans are targeting the seat and view it as one of their best opportunities in 2018 to flip a House seat. 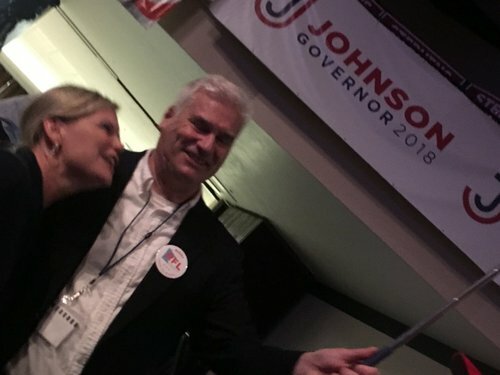 Sixth District Congressman Tom Emmer is warning Minnesota Republicans against getting discouraged by talk of a Democratic surge in this fall’s election. Emmer says Republicans stand to make gains in their elected ranks in Minnesota. Emmer says he thinks voters will be convinced that the country is headed in the right direction. “All you ever hear about is Russia, Stormy or some tweet. But while our media is distracted, the president and you and me, we are winning," Emmer said Saturday in an address to the state Republican Party convention in Duluth. Minnesota now has three Republicans in the state’s eight U.S. House seats. 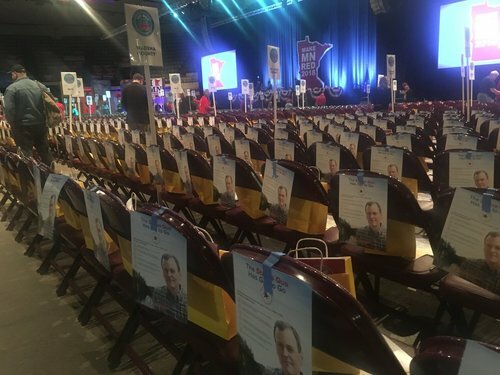 But the GOP is fighting to flip at least two seats while fending off challenges to a couple of incumbents.
. @kDaudt brought a video of his Line 3 pipeline speech on the House floor to play for #mngop delegates. Paulsen says he will not be "out hustled." He also called Phillips an ATM for Democrats. 3rd District Republican Congressman Erik Paulsen to state GOP convention this morning: "I know I've got a target on my back." DFLer Dean Phillips is waging a campaign to defeat Paulsen. Phillips is well-funded and well-organized. I've spoken to a few #mngop graybeards. None can recall a #mngov race in recent memory where there was an endorsement deadlock. Last big race where it did happen was '96 Senate contest, also here in Duluth. Housley won endorsement with 74.3 percent support on the first ballot. Delegates to the Republican State Convention have overwhelmingly endorsed State Senator Karin Housley’s campaign for U.S. Senate. But Housley will face an August primary challenge that she’ll have to win to get on the ballot to take on DFL Senator Tina Smith in November. 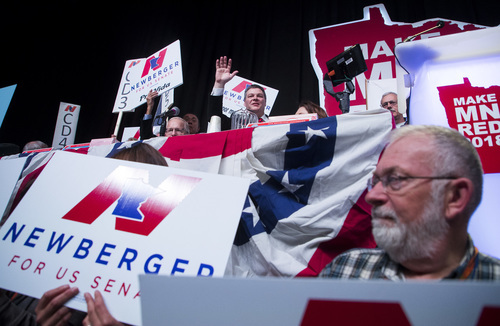 Jim Newberger (@newbergerjim ) endorsed for #mnsen race against @amyklobuchar . 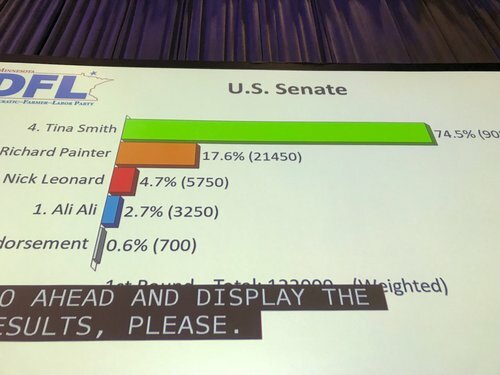 He got 79 percent on only ballot. 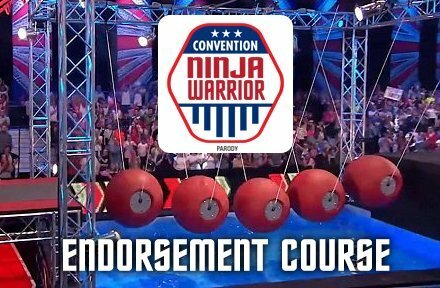 The sequel to this candidate convention video is gonna be lit. GOP Chair Jennifer addressed delegates just before 7:30 pm on problems with new balloting technology “I just wanted to apologize to all of you for the challenges and unforeseen malfunctions we’ve had with the electronic balloting,” Carnahan said. 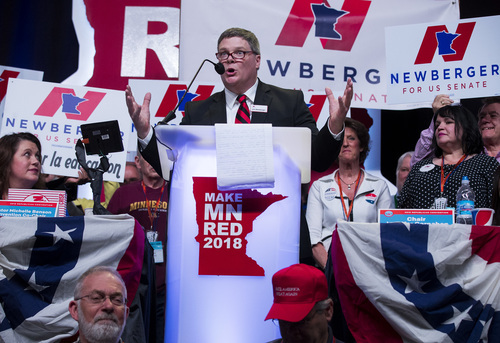 Republican U.S. Senate Candidate and state Rep. Jim Newberger, R-Becker, greets delegates at the 2018 Republican Party nominating convention Friday, June 1, 2018 in Duluth.